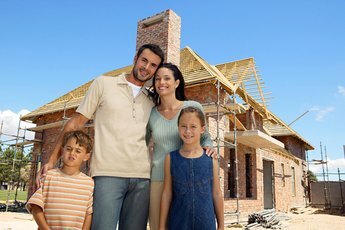 How Do I Build a House on a Shoestring Budget? Building your home yourself lets you choose all the design elements, from the ground up. A small budget makes building a home more challenging, but not impossible. A little creativity goes a long way, but you may have to scale back some of your more extravagant dream home desires. You'll need to decide where you're willing to compromise and where you aren't. Careful budgeting is also a must. Knowing exactly the amount of money you have to work with helps you plan out the building project and stay on track with the spending. To build a house on a shoestring budget, you'll need to reduce your expenses to free up a little extra money, choose plans that have less square footage and bargain shop for your materials. Before you build a thing, calculate the amount of cash you have available for building the house. After counting your cash, determine how much you intend and are able to finance. Use these figures to create a budget for the building project. To boost your budget, reduce your current living expenses as much as possible. Consider moving to a cheaper home, cutting out extras and purchasing only the necessities. This could free up a little extra money toward your home. Every bit of money you save makes your shoestring that much longer. You can't stick to a budget you don't have, and cost overruns are common when building. Set a budget, write it down and consult it often to make sure you're staying on track throughout the build. Just as an army needs the leadership of a general to keep order, home building requires a general contractor to oversee every aspect of the work. Play the role of general contractor yourself if you have the time and general knowledge about the process. If you don't have enough free time to oversee the project, you might be better off paying someone to serve as your general contractor. A general contractor adds an expense but may prevent the bigger financial drain of having to do projects over or correct mistakes. Spend the money to get accurate and detailed building plans for the home. Building plans are the instruction manual for the people putting your home together, so they're not the place to skimp. The home's foundation, walls and structural components are also wise places to invest. Interior finishes and details are things you can change at any time in the future, but only if the house is still standing strong. Structural shortcuts during the build will cost you in the long run. Invest more of your budget in the basic building blocks of the home to save money down the road. Make sure that you get a quality foundation, electrical wiring, plumbing, ductwork, heating and cooling system, roofing and windows because these items are more difficult to update. Structural components aren't the place to pinch pennies, but there are lots of other places where you can. Consider scaling back on the size of the home to save money on building costs. You'll also save money on utilities with a smaller home. If you need additional room, consider adding a second floor. The foundation and roof must both cover the entire footprint of the home, and both elements are expensive. 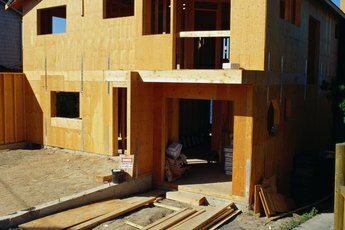 A second floor doesn't add to the size of these structures, so it costs less to build up than it does to build out. Look around for an affordable piece of land for building the home. Consider whether the land already has utilities run to it. It will cost more to prepare the land for building if it does not have utilities. Shop around for all of the materials and services needed to build the home, too. Negotiate with contractors whenever you can to get discounts on their services. When buying appliances, cabinetry and other finishing details, consider clearance items or buy used. Choose basic finishes to save money. You can always upgrade things such as flooring, cabinetry, fixtures, gutters, faucets and countertops if high-end versions aren't an option now. Do as much of the work on your new home yourself as your skill set allows. Paint the interior of the home yourself to cut costs. Handle other finishing details as long as you feel comfortable with them. Consider doing things such as installing tile floors, staining wood finishes, installing appliances and cleaning up after messy jobs yourself. Landscape your new home with only the basics. Get your lawn going to make the yard more functional and presentable, but don't try to recreate the Garden of Eden. Add landscaping features such as retaining walls, fences, trees, patios and planting beds in subsequent years when you have the extra money. How Much Do Interior Decorators Cost?